Ever had a need to track something? Ever had to ask you spouse to help you track something? Google Forms can be very helpful. 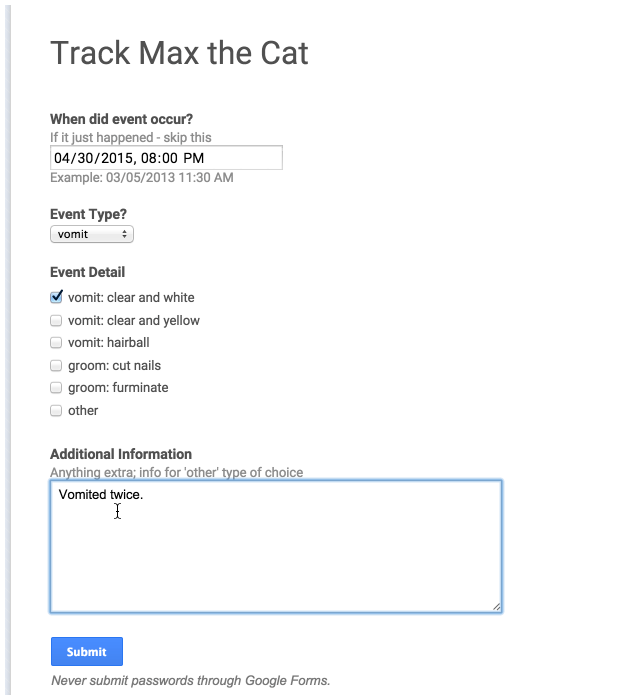 In this post I go over some quick steps to create a google form to track cat vomit (yes – I’m serious). I discuss the steps of form creation, and how to easily access this form from your smart phone (I use the iPhone as the example) so that both you and your spouse can track a common issue or thing. I know…you’re thinking ‘cat vomit – couldn’t you pick something better?’ My answer is that I try to pick real life examples, and this is as realistic as it is going to get. My cat, Max, has started vomiting recently…at least I think it was recent. I can’t tell if it’s a pattern or if it’s been happening for a long time and I’m over-worrying about him. I don’t quite know the line of cat weirdness and health problem…so it’s time to get some data. Putting my engineering hat on – I know that the first thing I need to do in characterizing any system is to collect data. Lots and lots of data. Granted I wont have a Hadoop cluster crunching this data, but I at least want a spreadsheet that I can show to my vet. It’s better than going in with the “I don’t know” response to everything that s/he will ask (like ‘when did it start’, ‘how long’, how often’, etc…). Speed of entry: I need to enter this data quickly. The quicker, the better. Ease of entry: While I can deal with most user interfaces, my wife is not so forgiving. She’s a pragmmatic ‘show me how to bring up the app/form and get out of my way’. She also doesn’t tolerate lots of extraneous UI crap because she has better things to do (and she really does have better things to do). In considering my budget (i.e. $0) and the problem at hand, I chose to use Google Forms to enter Max’s data. I have used Google’s services for years. I’m sure that they have a large data dossier about me due to my Gmail and Google docs usage (which includes forms). Putting aside the question of whether Google is evil, the key fact is that Google is a business and all of us users who use its ‘free’ services are its product. 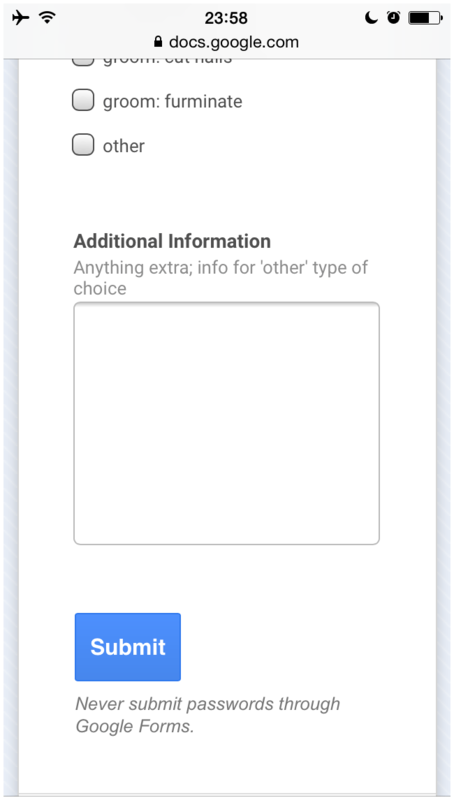 So if your data is sensitive, then you should NOT use Google Forms. Just think of yourself as a contestant in the TV show Big Brother, and Google is monitoring everything from the moment you use sites that utilize Google ads or enter their properties (Gmail, docs, Google search, etc…). If you’re in any way uncomfortable with this, then you should find a different way of recording your data. In this case, I’ve made the soul-searching decision that Max is ok with being tracked. Granted, Google might attempt to monetize on his vomiting when he surfs the web. But it’s a compromise that I’m willing to make, and he’s fine with it though he negotiated some additional treats for this concession. OMG – a picture of smores! 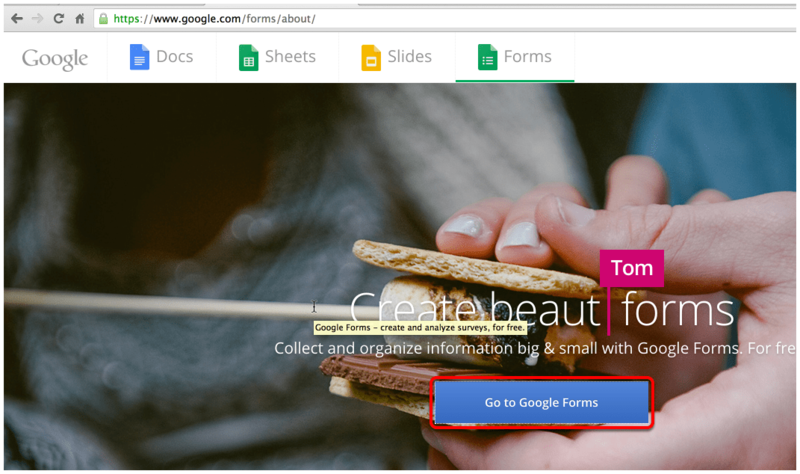 Google Forms are like smores? Maybe the graham crackers are the forms and the marshmallow is the data. 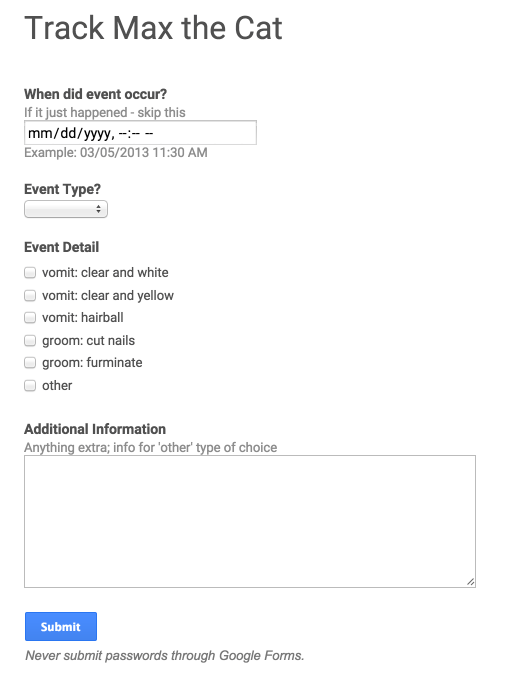 So in this case the chewy center is vomit related data…fantastic. Click the “Go to Google Forms”. 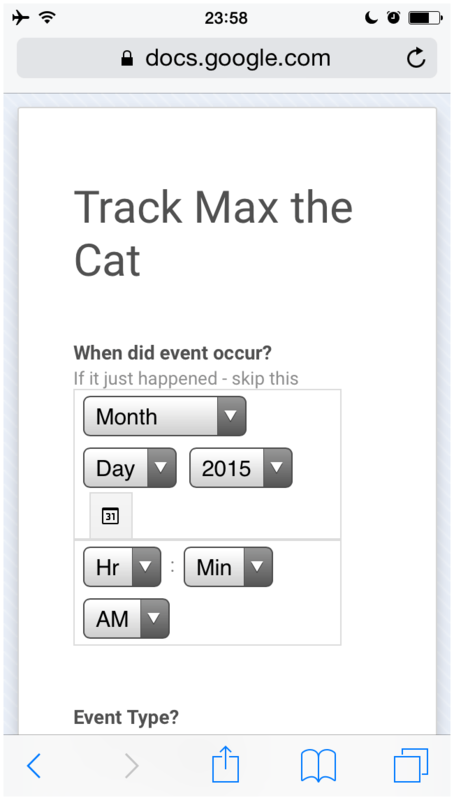 I put this as the first question because the date/time when I (or my wife) remember something about Max’s behavior may be different than the current time/date of this data’s entry. Notice that I made this an optional question (as most are on this form) because I don’t want my wife to not to use the form. 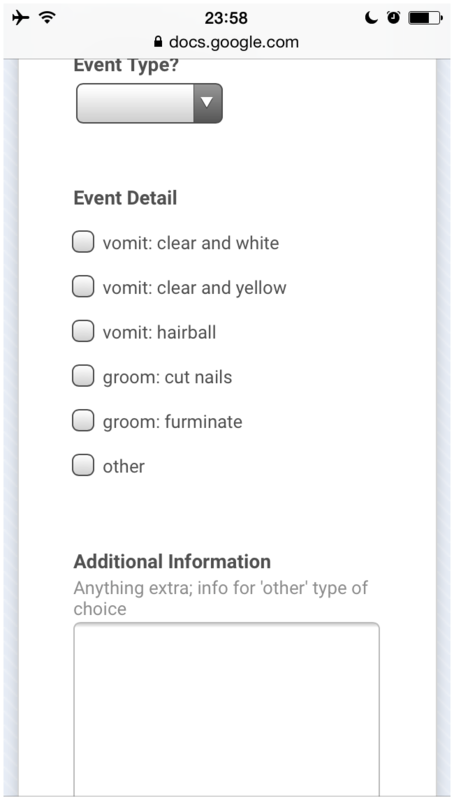 This is a dropdown for the type of event that happened. This ends up being somewhat of an extraneous question (see further down this article in the ‘fine tuning’ section). This is the fundamental and most important question of the form. There should be at least one required question. 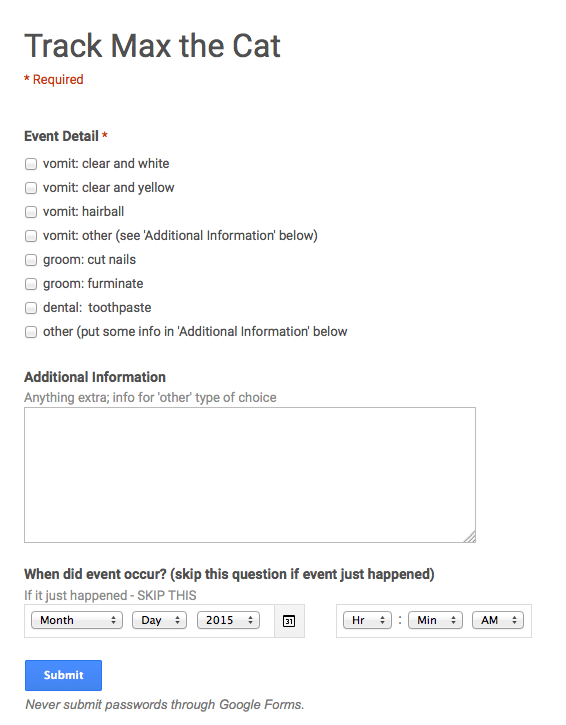 In this case, the event detail should be the only required question. I didn’t check the ‘Required question’ box here but I will later (see ‘Fine Tuning’ section). I obviously wont remember all the possible Max issues and behaviors, so I have a catchall (the is the ‘else’ part of my if-elseif structure for my dev friends). Steel yourself – this will be an exciting form. This is the screenshot from a browser. However, the mobile version should be pretty usable since there are few fields. So it should be ok in terms of my ‘speed of entry’ and ‘easy of use’ criteria. Google automatically creates a Google Sheet (i.e. spreadsheet) for the data that gets entered into the form. This is one of the key benefits. I can also print it and download it as an Excel file (so I can email it to my vet…s/he LOVES email attachments >:-) ). I want to test my form as a non-logged in user. In this case, I use Chrome’s incognito mode. In this way I’m guaranteed to view the form as a non-logged-in user. If I wanted more privacy, I would use Firefox rather than Chrome since it guards privacy better, but since I’m using Google’s services – it doesn’t really matter since my data kimono is already open. Notice that the form response Google Sheet will always have a Timestamp column (the first one), which is why additional date/time is optional and only useful if the actual event’s time/date is significantly different from the time/date when the form is used. For this form to really be used by me and my wife, I need to place it on our iPhones. 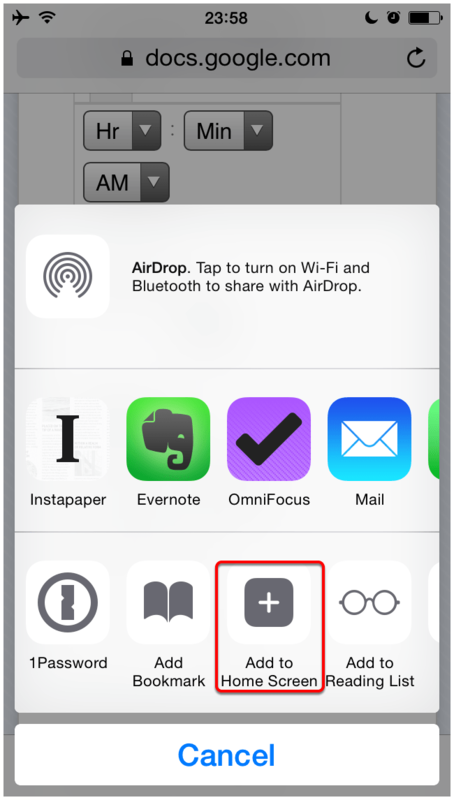 What I’m actually going to do is I’m going to place it as a link via the “Add to Home Screen” feature of the iPhone. This features allows you to create a an icon on the iPhone and when you tap it – your iPhone’s browser will go straight to the specified link. In our case, I want to go straight to the form. Email it to myself and my wife. 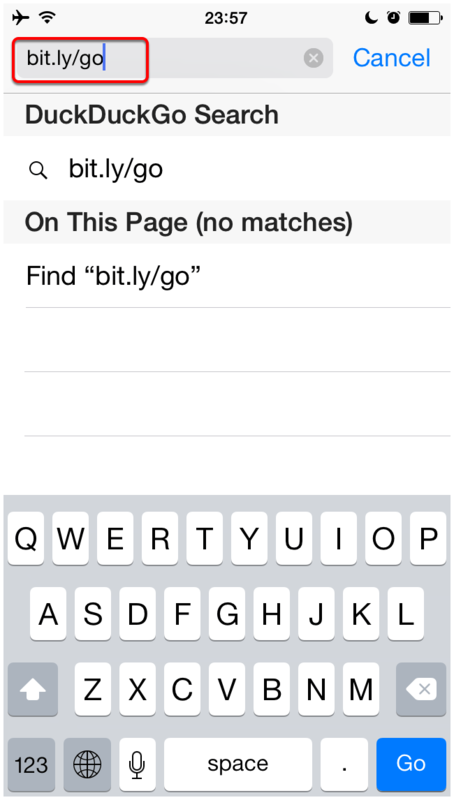 Use a URL shortner (such as bit.ly) to create a memorable link so I can easily put it in the phone. I’m a big fan of http://bit.ly and the company behind it. In this article, I chose to go with the second option. This way I can add it to as many devices as I want to. So – the first thing to do is to go to bit.ly and log-in. 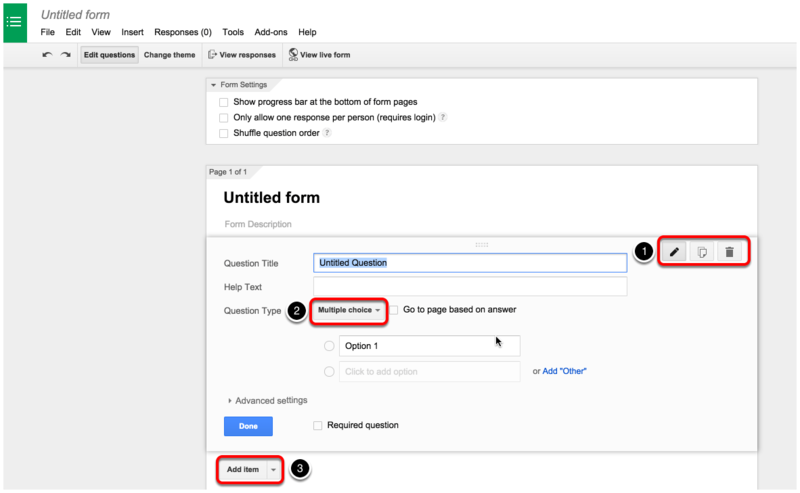 By-the-way – remember the warning that I gave about Google Forms at the top of this article? It applies to bit.ly too (heck – it applies to any web service that you use). I paste in my form’s url here. What’s that? Why am I not showing my form’s url? Because Max wants privacy when it comes to his vomity activities…sheesh. 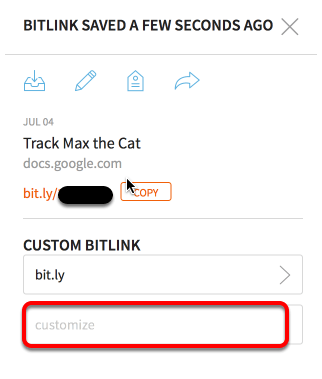 Initially, bit.ly creates an ugly link that I would never remember. 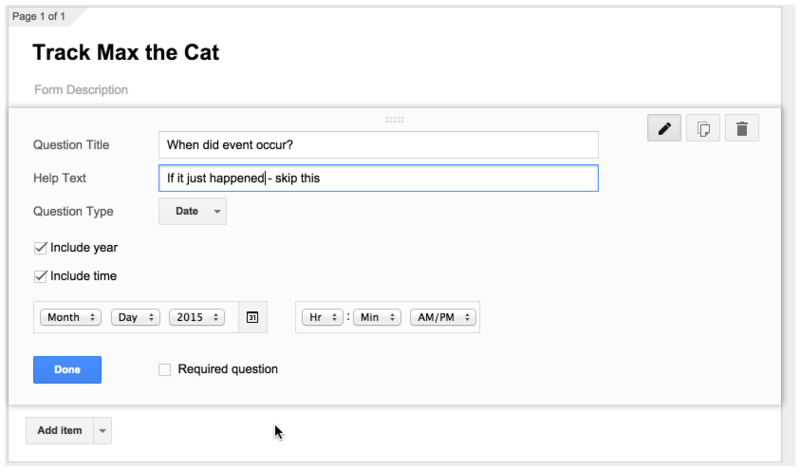 So I use the ‘customize’ field to put in something memorable (like ‘superkittyvomit’). I put the memorable bit.ly link that I just created in the the iPhone’s browser (i.e. Mobile Safari). Now the iPhone’s browser (i.e. Mobile Safari) loads my form. It’s time to sit back and soak in the form’s beauty 🙂 . I scroll around to make sure it works as expected. Pressing the small upwards arrow on the bottom of the iPhone’s browser brings up a bunch of options. I choose “Add to Home Screen”. This will save a link to my form as an icon. I can change the iocn name but I leave it alone since it makes sense to me. While it isn’t an app, it is easily accessible as one. When I touch the ‘Track Max…’, the iPhone’s browser will open and go straight to my form. I perform the same iPhone steps on my wife’s iPhone. Because of that bit.ly link – I can do this really fast and get back to watching Marvel’s Agents of S.H.I.E.L.D. After creating the form – I re-looked at it and realized that I wasn’t capturing the most important question (i.e. ‘Event Detail’). So I went back and cleaned up the form and placed the most critical question at the top. I also placed the optional date/time question at the bottom. This irks me a bit because I feel like it must be at the top. However, in considering my wife’s usage, I realized that the pragmatic choice is to put the date/time question at the bottom. I rather that the most important question be at the top and everything else come afterwards. Note that I did not delete any columns (i.e. 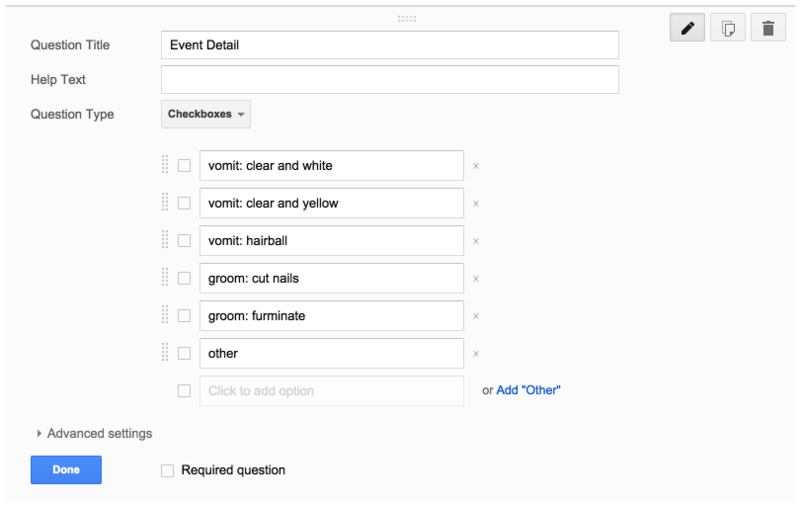 like the ‘Event’ column) in my Google Sheet. My reasoning is that I can always delete that column in Google Sheets or Excel and I rather make sure that the Google Form operates properly (besides the fact I have very little time to further mess with this thing). Well…the final form at this point in time. You may bask in its glory and enjoy. What’s that? Why am I repeating myself with ‘skip this question’? Well – previous forms/experiences have shown me that my user (i.e. wife) tends to hesitate on whether to answer that question or not. In other words, she’s not sure if she really needs to answer this question (remember – she has better things to do). It creates a sort of cognitive dissonance which may not be worth it. Frankly, I’m tempted to remove this question all together and let my user put the date/time in the ‘Additional Information’ question if need be. I can now track my kitty’s behaviors. My wife will hopefully use my fantastic Google Form to help with this data collection. 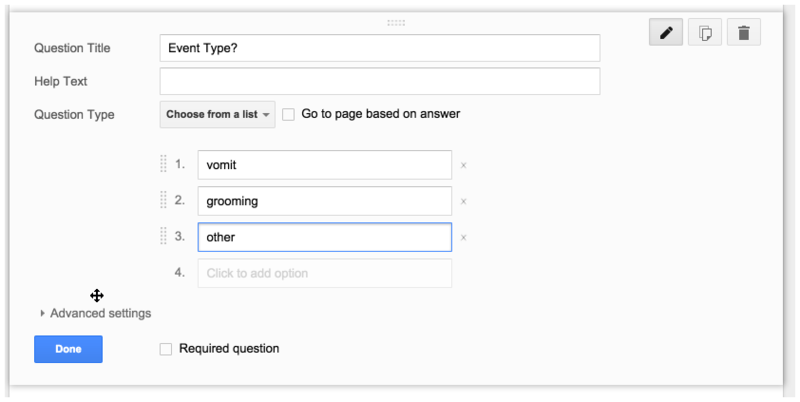 So that’s it – Google Forms at its best (or worst depending on your point of view). You can track anything – pets, kids, car problems, co-workers, etc… . Go forth and Google Form away. If you like these instructions – put a comment on this article or let me know via twitter. 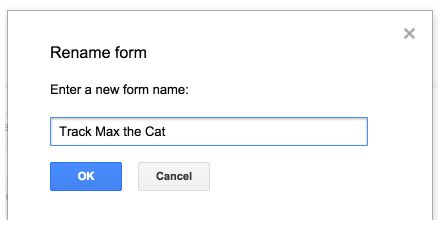 2015-09-01: I’ve changed the title and the URL link from “Cat Vomit and how to use Google Forms” to “How to use Google Forms to track anything”. The title just felt wrong and it’s bugged me over the past week. I’ve also modified the summary section to complement the title. This is some quick security information related to Adobe Flash browser’s security. The usual disclaimers apply. If you’re worried that this page has links that may lead you to some malware sites then please just go to DuckDuckGo (just type in https://duckduckgo.com in your browser) or Google and search on the items that I’m referring to. You’re camping in the woods with your family and some friends and your prankster friend John gives you a bottle of suntan lotion telling you that it’s the best stuff he’s ever used (he hasn’t pulled a prank in a long time, so you’re lulled into a sense of trust). Unbeknownst to you – John substituted %75 of the sun tan lotion with pure honey. You slather the stuff and lie back on the camping chair to absorb the sunshine. You fall asleep in a nice midday nap. An hour later, you wake up with a stinging sort of pain all over your arms and legs – the very places where you put that honey infested suntan lotion. Bees are stinging you, and all kinds of bugs are chewing on you and that wonderful smelling lotion. You run screaming into the questionably clean camp showers as you vow to give John some payback. As you scrub off the lotion you discover…. Adobe Flash is that honey from the analogy and the stinging bees/bugs are all those hackers that want to get your data (personal information, log-in access to your online bank account, and anything else that might be of value). Adobe Flash is an old technology that at one point provided the ability to receive rich media when browsers didn’t good native capabilities to do so (whether web games, videos like YouTube or those graphical billboard like ads). Steve Jobs wrote a very scathing and clear letter about Flash’s problems. His criticisms of Adobe Flash are as relevant today as they were in 2010. Although he focused on its use on mobile devices, the problems he outlined apply to Adobe Flash and its ilk across the board. Your browser. Any browser that you are using regardless of operating system (whether it is on Mac, Windows or Linux). Now. You are vulnerable right now. While Adobe Flash has had a continuous string of security issue, recently it has had several zero day vulnerabilities that have come to light through the hacking of an Italian company called Hacking Team. You need to to deal with Adobe Flash because it is a HUGE attack vector in order to reduce your attack surface. Enable ‘click to play’ on Flash. This will prevent Flash from running automatically and it will give you the ability to play if you have to though most times you won’t have to. Note that the latest version of FireFox does this for you, but to be safe you should still make sure that Adobe is not enabled by default. You can tell that Adobe Flash is running by going to Adobe’s site (). If you see a spinning cube that keeps bouncing around at the top of your screen, then Flash is enabled by default.